Before too long someone is going to get hurt. It is just a matter of time. I was visiting a very large auto repair shop a few years back getting ready to teach a hybrid class there the next day and the owner was giving me a tour of his place. His service facility was clean, well-lit and he was very proud of his reputation and service. As we walked down an isle of used and new parts on metal racks in an attached building I noticed a Toyota Prius high voltage battery pack on the lower shelve. The front safety cover was missing. I assume it was removed to access the orange colored high voltage (HV) cables. I stopped to point out a real safety issue. He took it well and decided to attend the class I was teaching his technicians that night. The owner had little training in hybrids. What lessons were learned? Here is what went wrong. When the Prius came in the owners decided to replace his HV battery with a used one. The salvage yard did not have a core charge so the service manage wanted to save it as it had a computer, contactors and more. Problem #1-The HV pack was on a metal shelve. If this battery pack had a high voltage leak the metal shelve could become live and touching the pack and the shelf could put you in the circuit. Deadly combination. Problem #2- No sign on the live pack. The HV battery needed an orange sign on it that said “Danger! High Voltage Present. Do not handle”. Problem #3- The safety cover was missing on the used unit so a cover of some sort was needed to keep bare hands off the high voltage contactors. Problem #4 The Service Plug was left in the battery. The one thing that helps keep people safe was not done. The entire shop needed basic EMV high voltage safety training. 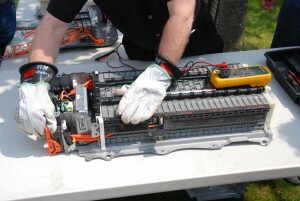 When moving the used battery, always wear HV safety gloves with leather covers over the rubber gloves. They are required. Some shops that have the space could make a safe room for high voltage parts with a sign on the door and keep it locked. Safety First. The owner of that repair shop unknowingly put everyone at risk with that Prius HV battery. I tested it with my DVOM and it has over 200 volts at two terminals that were uncovered. It takes only 60 volts and ¼ amp to kill.